It is 3 in the morning. I went to sleep about twelve or so because Darren was threatening to take his leads out of his head and he tried to take out his IV line a well. He seemed to be sleeping so I fell asleep. The next thing I know he is yelling OUCH and standing at the side of the bed literally pulling the large strand of leads as hard as he can. 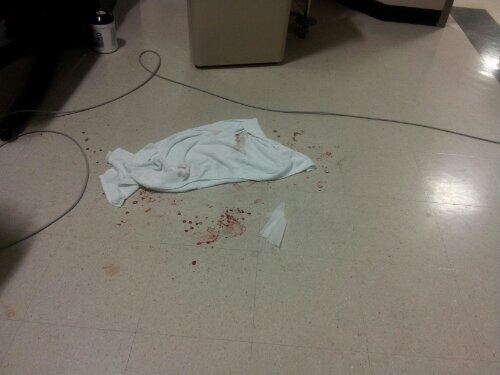 I move to open the door and get the nurse and I turned around and found him standing in a pool of blood. Blood was coming down his face as well. He was so disoriented! He ended up pulling 5 or 6 leads completely out of his head! Had four nurses come and help. They rushed him to get a CT scan after they got him cleaned up.